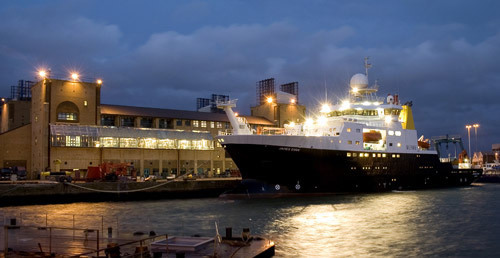 Since 1998 the University of Southampton, hosted by the National Oceanography Centre, in collaboration with Brookhaven National Laboratories (BNL) has been engaged in various instrument development activities with the objective of delivering autonomous, ship-based in situ skin sea surface temperature (SST) measurements in an operational manner to validate skin SST. The result of these efforts is the Infra-red SST Autonomous Radiometer (ISAR) which can be deployed on ships of opportunity unattended for periods of up to six months with a SST measurement accuracy of ± 0.1K. The ISAR instrument measures in the spectral waveband of 9.7 - 11.5 µm and has a measurement range from 173 - 373 K. The onboard calibration is done by two radiance cavities, one heated and one at ambient temperature. The infrared radiation is reflected via a 45° mirror on scan drum through a water proof window onto the infra-red sensor. A measurement cycle includes the two radiance cavities, a sea viewand a sky view and can be completed once every three minutes. The ISAR also incorporates a roll and pitch sensor to validate the measurement angles and a GPS for position information. Furthermore it has a shutter mechanism which closes when rain or spray is detected by the optical rain gauge, thus protecting the instrument from water ingress on the critical optical surfaces. To improve the quality of the skin SST measurement a number of ancillary instruments can be connected to the ISAR, where the data is logged. The instruments which have been used on deployments such as on the Pride of Bilbao are a hull mounted thermometer a pyranometer and a anemometer.